With the body on the frame and the engine/trans in place it is time to think about the exhaust system. On a highboy the exhaust is something that can make or break the overall look of the car. Standard block hugger headers work well but aren't exactly the look needed for a car that's more "hotrod" than street rod. Lakester headers like those in the picture below are an option that many people used but these were a bit more prevalent in the 50's rather than the '60s. 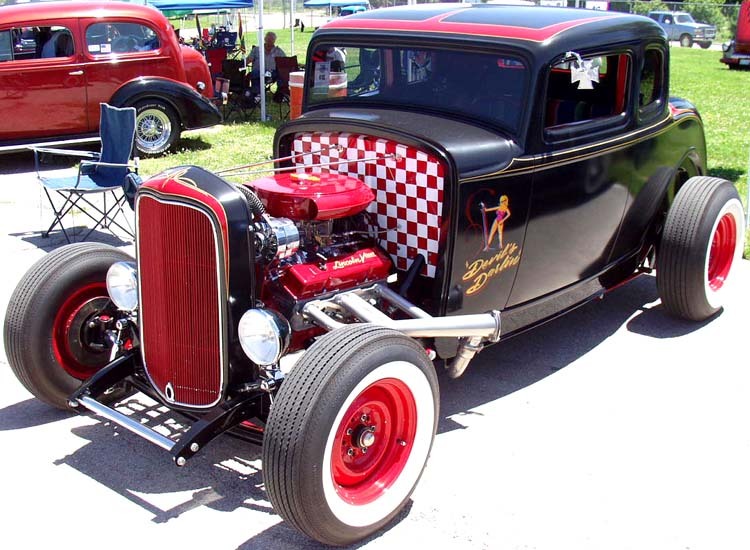 By then most hotrodders had seen the advantage of equal length headers and full outside the frame long tube headers were now more common as evidenced by the "American Graffiti" Coupe. These Lakester headers are typical of '50s hot rods, but in my opinion aren't really appropriate for the early '60s era. With the decision to use full-length headers there are a couple choices. Roadster headers and Sprint style headers. The differences here are mostly aesthetics. Roadster headers have individual tubes that pretty much meet at a long collector. Sprint style has individual tubes that come together earlier and generally have a shorter collector. There are exceptions in both cases of course but those are the general descriptions. For this project I chose the sprint style headers which for some unknown reason seem to appeal to me more than roadster headers. Now I don't recommend building your own headers because it's a lot of work, even if you're using a "kit". However, sometimes you just have no choice. When looking for headers for this project I just couldn't find any commercially available headers (sprint or roadster styles) that seemed to fit the theme of the project. What headers I did find wouldn't fit in the chassis the way I wanted without modification so..... I decided to take the time to make or better yet adapt a set of headers that will give the "hot rod" appearance that I'm looking for. There really aren't a lot of choices when searching for long tube headers for early hemis. HotHeads makes a nice set and there are some others but in order to wind up with a set of headers that fits correctly there's just no getting around the fact that there will be a lot of custom modifications necessary. I decided on a Patriot header kit designed for the big block Chevy. Why??? A couple of reasons. First because this kit has header tubes that are the right size (2") and will fit the set of HotHeads flanges that I have and second, because the exhaust port spacing on a big block Chevy is within a quarter inch of the hemi's which will make some of the modifications a little easier in order for them to fit correctly. The basic "kit" consists of four pre-bent tubes and a collector for each side along with flanges for the big block Chevy. I will not use those of course but you can't purchase the kit piece meal so the flanges will be donated to a friend who can use them. The first thing I needed to do was make a set of mini zoomies in order to allow the exhaust tubes to come off the engine horizontally and over the frame rail. The early hemi's exhaust ports exit at a 65 degree angle down which helps making exhaust systems easy most of the time but not in this case. As a side note the angle of the exhaust ports on an early hemi is exactly why you can put one anyplace you can fit a small block Chevy with headers. The SBC exhaust exits straight out the side of the head and by the time you stick headers on it the overall width is just about the same as the width of an early hemi. This photo shows the exhaust flanges after the mini zoomies have been fabricated and welded in place. I used two "J" bends of 2" diameter tubing and cut them into sections which generated the angle needed to allow the exhaust to exit horizontally at 90 degrees. Then it's just a matter of fitting each tube in place and welding things together. In reality its a bit more complicated than that. The big block Chevy's exhaust ports are positioned much higher in the head than the hemis so the tubes were all to long in terms of overall height. This meant that each tube had to be cut and re-sized in order to have the proper clearance to the ground. They also had to be cut and fitted to clear the frame and suspension correctly. As you can see in the picture above each tube was cut, custom fit, and welded back together so that the finished product fit correctly. In this shot you can see how the exhaust now exits the heads horizontally and how each tube easily clears the frame. You can see here that the collector exits just below the frame. There is plenty of clearance to the ground and this location will make it easy to run the exhaust under the frame and then back through the mufflers. I still need to weld on a collector cap and install the tube that will run under the frame rail but the major work on the headers is now done. The one thing that I was worried about was tire clearance to the front tubes when the wheel is fully turned. As it turned out I have over an inch which is enough to keep everything free and clear even at full suspension compression. Check back often for more updates on the exhaust. I'll be adding more info in a few weeks showing how the rest of the exhaust system will be run. There are still challenges ahead especially when you consider that a deuce frame doesn't provide tons of room for exhaust especially with a ladder bar rear suspension.